There are as many interesting and funny ways to work with presenting the new vocabulary as you have time and imagination to prepare them. Music like Jazz music in the USA is used in presenting the new vocabulary in schools and colleges. What does "Learning a new vocabulary" mean? It means more functioning to language for real things we need to do or use in our daily life. It means more communication with others' language and culture. I t means more knowledge for us. It is the learning that happens in real situations among 2 or 3 people in daily life when they participate in fun, interesting language-rich activities in English. This can happen through the internet with Fan-fiction which makes connection between the learner and the text, images, culture form or genre. Ex: Fiction practices about Sherlock Holmes. It is the way that focus on learning the meaning traditionally when they work on a vocabulary lesson. 1-Using real things (realia)and real situations of the learner's daily life and surrounding environment to refer to the new vocabulary. 2-Miming, gestures, interaction and acting to function the new vocabulary and the new structures, idioms or phrasal verbs. 3- Drawing or showing a picture,a painting as a demonstration and using the blackboard and computer power point program. 4-Using flash word cards, building words card, building sentence card, word slide, easy reader, a calender, syllable wheel, a poster, flip chart ,tapes,video films and data-show. 5-Making sound effects, motions, real practice or action. 6- Making illustrations, showing evidence, experiments and using web-word or mind-mapping shapes. 7-Using synonyms, antonyms, derivatives and conjunctions. 8-Functioning the word in a sentence, a mini-dialogue, a language function, a song or a game. 9-Definitions of the word if it is a verb, a noun, an adjective, an adverb, a gerund, a joining word, a relative pronoun,etc. 10-Describing the word and using puzzle words and diagrams. 11-Listening, speaking, or interviewing with pointing and repetition. 12- Encouraging guessing, thinking, imagination and elicitation. 13- Using inductive , abductive and deductive methods of teaching beside the pair work to support the activity-based teaching method. 13-Encouraging the learner to use a mono-lingual dictionary to encourage independent learning, self-exploration and discovery teaching method. 14- Using the web word, family word charts, prefixes and suffixes. 16-The teacher can present the new vocabulary through electronic programs like: "Lingoes program", "The Sage program", "Anki program." 17-The exercises that test the new vocabulary can be implemented through electronic programs like "The Hot potatoes program". Traditionally, the teaching of vocabulary above elementary levels was mostly incidental, limited to presenting new items as they appeared in reading or sometimes listening texts. This indirect teaching of vocabulary assumes that vocabulary expansion will happen through the practice of other language skills, which has been proved not enough to ensure vocabulary expansion. Nowadays it is widely accepted that vocabulary teaching should be part of the syllabus, and taught in a well-planned and regular basis. Some authors argue that vocabulary should be at the centre of language teaching, because ‘language consists of grammaticalised lexis, not lexicalised grammar’. We are going to discuss aspects of the ‘Lexical approach. A-Does the new word refer to a concrete or abstract word? B-What is its part of speech? Visual elements work best with concrete nouns, but try to go beyond flashcards and illustrations. Try to use real objects whenever possible, or even sounds, smells, and tastes. Appeal to all of your students’ senses! Opposites, like “big” and “small”, “long” and “short”, are usually illustrated with pictures, but here’s another case where realia will help you teach new adjectives; the use of real life objects is wonderful for words like “soft” and “rough”, adjectives that may take precious minutes of class time to explain. For more advanced adjectives, like “stunning”, “gorgeous”, “spectacular”, “huge”, or “immense”, bring in photos of famous sights from around the world like the Louvre, Egyptian pyramids, the Eiffel Tower, etc…then use these new adjectives to describe these places in ways that clearly illustrate their meaning. Verbs can be taught through real situations, real material and acting the scene that contains the new vocabulary. Assimilation can be used also. Adults (either alone or with the child(ren)) should preview reading materials to determine which words are unfamiliar. Then these words should be defined and discussed. It is important for the adult to not only tell the child(ren) what the word means, but also to discuss its meaning. This allows the child(ren) to develop an understanding of the word’s connotations as well as its denotation. Also, discussion provides the adult with feedback about how well the child(ren) understands the word. After pre-teaching vocabulary words, the child(ren) should read the text. Learner 1 : What are you fond of ? Learner 2 : I am fond of................... . What about you? Learner 2 : I am fond of....................... What about you? I elicit the rule form from the students themselves. How? 1-What repeated words have you practiced? 2-What does the structure consist of? 3-What comes before the pattern? 4-What comes after the pattern? Adults often forget a person (especially a child) needs to hear and use a word several times before it truly becomes a part of her vocabulary. Providing multiple opportunities to use a new word in its written and spoken form helps children solidify their understanding of it. Teach him a “word clue” to help him understand it. This “word clue” or keyword might be a part of the definition, an illustrative example or an image that the reader connects to the word to make it easier to remember the meaning when reading it in context. At the top or center of the organizer is the vocabulary word. Branching off of the word are three categories: classification (what class or group does the word belong to), qualities (what is the word like) and examples. Using prior knowledge the child fills in each of these three categories. Word maps help readers develop complete understandings of words. The words either contain a “core” root (the primary component of the word) or use prefixes or suffixes that hold meaning. Adults should focus on teaching children the most commonly occurring roots, prefixes and suffixes. As each is taught examples of its use in common word should be shared and examined. The reader should see how the root helps her understand the word’s definition. Children should then be given practice analyzing words to determine their roots and definitions. When a reader is able to break down unfamiliar words into their prefixes, suffixes and roots they can begin to determine their meanings. A portion of the difficult words can be replaced with “easier” synonyms to help the reader understand the overall text. Vocabulary footnotes (definitions provided at the bottom of the page) can be added for particularly challenging words so that the reader can easily “look up” the word while still reading the text. An accompanying vocabulary guide can be provided for the text. Words that are included in the guide should be highlighted or printed in bold text to direct the reader to check the vocabulary guide if the word or its meaning is unfamiliar. you can determine the word meaning based on what the rest of the sentence focuses on. Texts are full of “clues” about the meanings of words. Other words in a sentence or paragraph, captions, illustrations and titles provide readers with information about the text that they can use to determine the meanings of unfamiliar words. These features are often referred to as “context clues” because they are contained within the context of the piece of writing rather than outside it. There are several aspects of lexis that need to be taken into account when teaching vocabulary. Knowing not only what lexis refers to, but also where the boundaries are that separate it from words of related meaning (e.g. cup, mug, bowl). Distinguishing between the various meaning of a single word form with several but closely related meanings (head: of a person, of a pin, of an organization). Distinguishing between the various meaning of a single word form which has several meanings which are NOT closely related ( e.g. a file: used to put papers in or a tool). 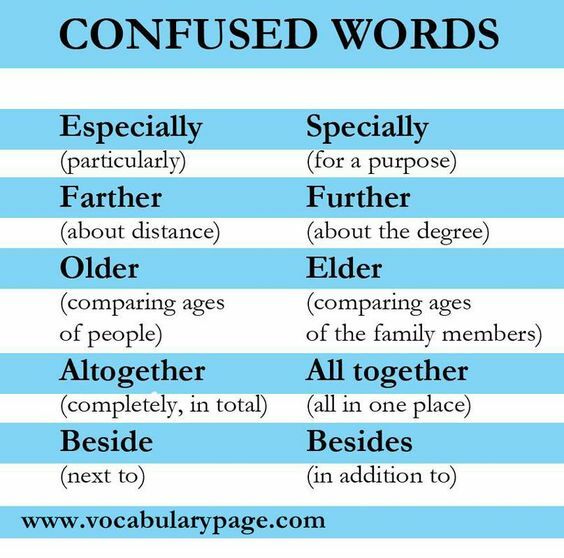 Understanding words that have the same pronunciation but different spellings and meanings (e.g. flour, flower). Distinguishing between the different shades of meaning that synonymous words have (e.g. extend, increase, expand). Distinguishing between the attitudinal and emotional factors (denotation and connotation), which depend on the speakers attitude or the situation. Sociocultural associations of lexical items is another important factor. Being able to distinguish between different levels of formality, the effect of different contexts and topics, as well as differences in geographical variation. Awareness of certain differences and similarities between the native and the foreign language (e.g. false cognates). Multi-word verbs, idioms, strong and weak collocations, lexical phrases. Learning the rules that enable students to build up different forms of the word or even different words from that word (e.g. sleep, slept, sleeping; able, unable; disability). Ability to recognize and reproduce items in speech. 1-The Amideast Forum: Vocabulary elementary and per-intermediate. 6-Amideast Forum: English Vocabulary Exercises. 8-(Video). Techniques to remember vocabulary.